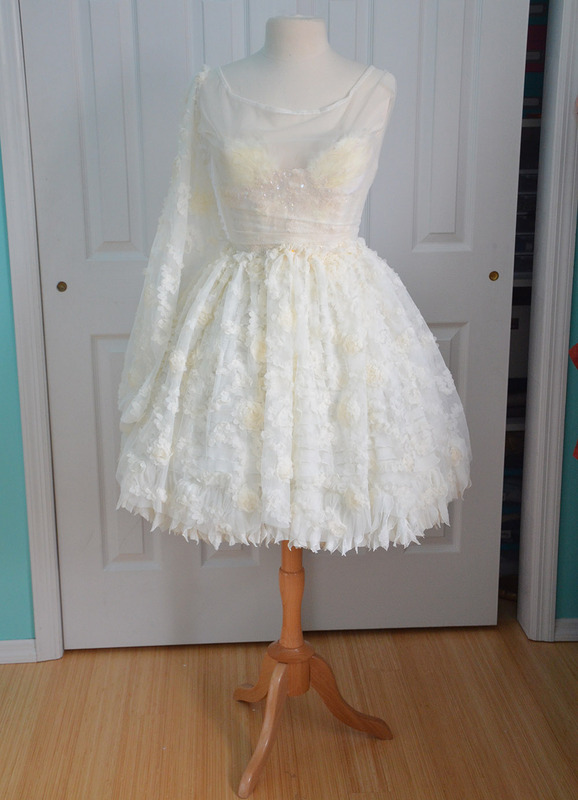 This is the final post in a series of three, the previous two posts talk about making the dress and underskirt for this project. They can be read here. 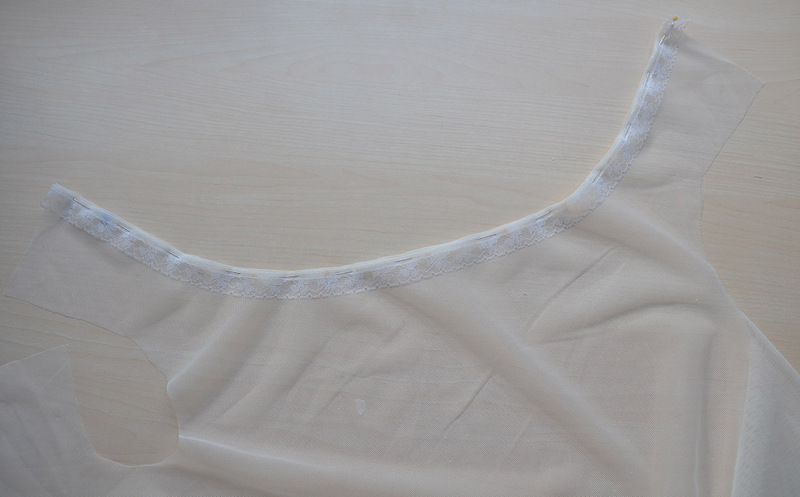 This post is about making the bodice overlay and sleeves! My goal with this project was to create a dress with a lot of texture. I planned on achieving that by layering lace/chiffon/jersey/sequins and making it cohesive with a layer of mesh overtop. But I ended up disliking the effect, since the mesh muted the texture rather than adding any. 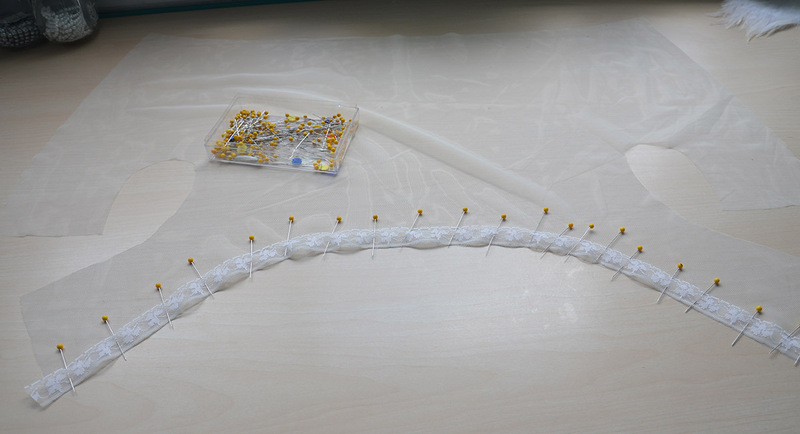 Which is why this overlay is removable instead of being attached to the dress. The first step was draping. I wanted to make the overlay seamless, because seams in sheer mesh look pretty awful. Luckily the mesh i’m using is stretchy which makes that possible, but the mock up fabric was not. So I draped it with a single dart at the bust, then removed that when transferring it to paper. I seem to be missing a bunch of photos for this post, including ones of the paper pattern, which is a bit annoying! You will get a good idea of what it looks like later on so I guess it doesn’t matter much. After transferring the overlay pattern to paper I cut it from the mesh. Then I pinned lace around the neckline. The lace got stitched on, then folded inward to create a nicely finished edge. 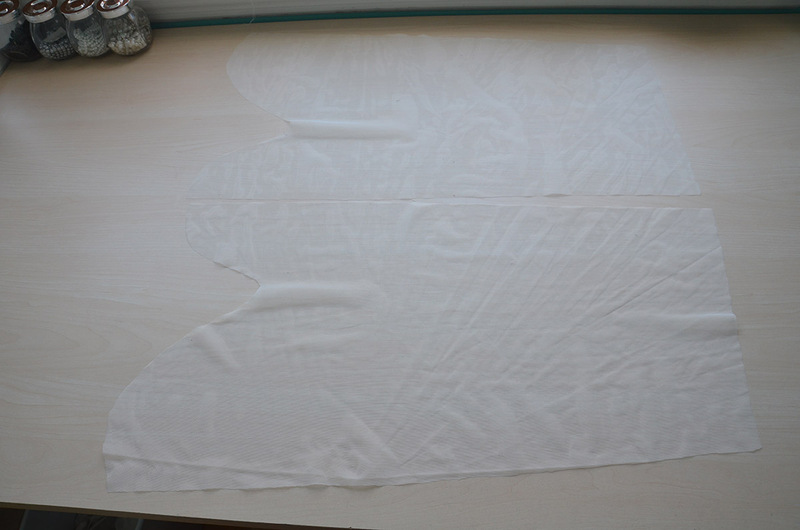 This material doesn’t fray but the edges will stretch and pucker if they are left unfinished, which I didn’t want. 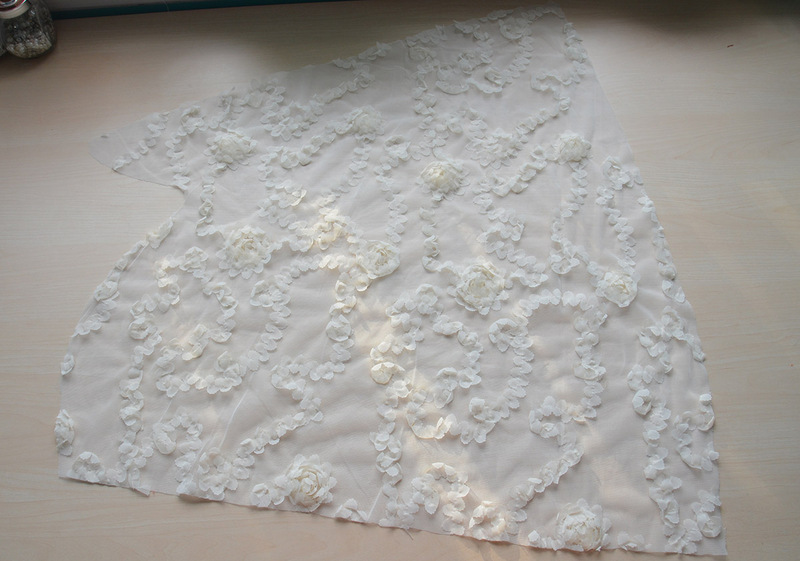 I hand stitched the edges down, then trimmed the excess lace. I repeated the process on the arm holes. I had originally planned on french seaming these, but this ended up being easier and faster so I went with it! Then it was time for sleeves! My first sleeve plan was to make large bishop style sleeves from the floral mesh. I was so confident in that plan that I cut that sleeve pattern out. It looked like this. 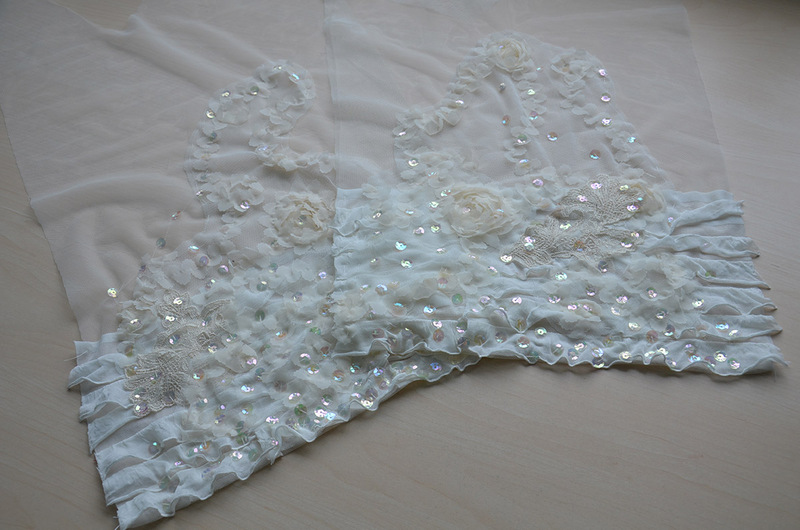 But after gathering them and pinning them onto the dress form I changed my mind. I felt that made the dress too top heavy, and the sleeves being cut from the same fabric as the skirt made the whole thing less “elegant” – even though that isn’t a word I would use to describe this dress. So I tossed that plan. Instead I cut slim fit sleeves from the plain mesh. They got the same treatment as the dress bodice. 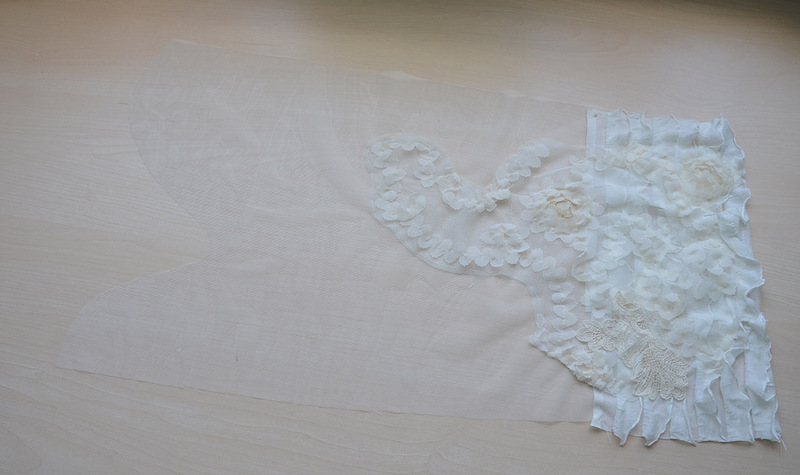 I stitched the ruffled jersey on first, then I sewed fussy cut bits of floral mesh overtop along with the few remaining scraps of lace. And that got covered with sequins! I made them more dense towards the wrist to create a gradient effect of sorts. After a quick try on I realized I made the sleeves a little short. So I added a ruffle, which is my answer to lengthening everything. I stitched the sleeves on and did up the side seams and bam, a functional bodice! But it was still missing closures at this point. Before wearing it I added two ties several inches apart, which looked like this! 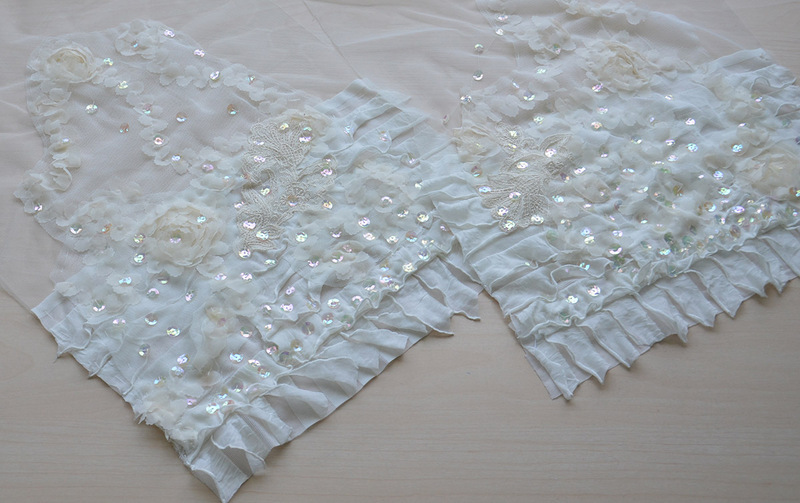 These looked really pretty when done up on the dress form. But on me they looked really awkward and made it look like I had rolls of back fat. Soo this will have to be changed out and replaced with an extra mesh panel and zipper before ever leaving the house in it. 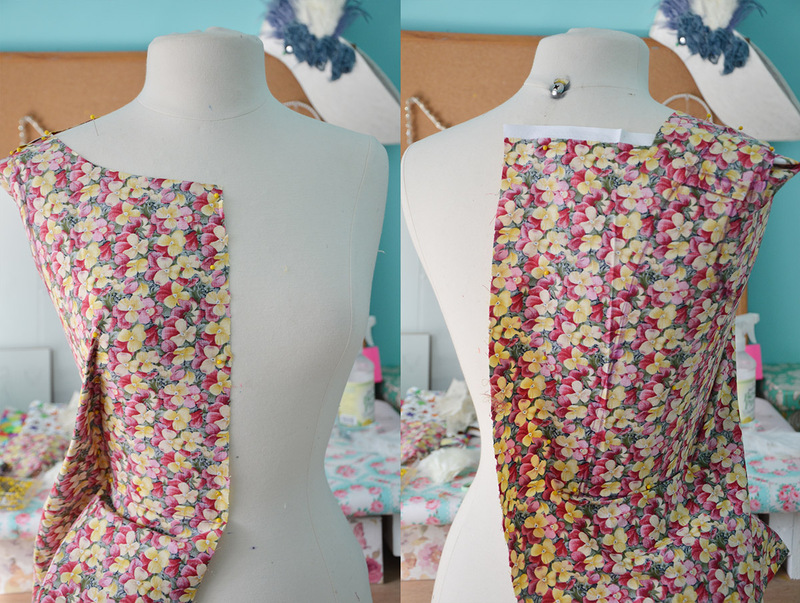 I also cut out a waist tie! All of these are really wrinkly because this fabric irons horribly and I was too lazy to steam it before cutting. Which is bad, don’t do that! I feel like the skirt should be an inch shorter. And that strap thing needs to be fixed, but other than that I really love this dress! I think it’s very cute all together. 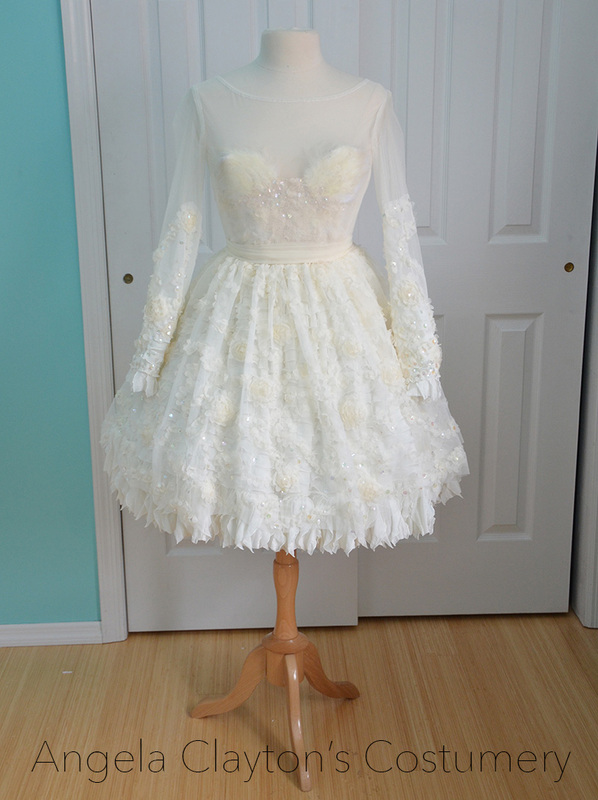 It is probably a bit too bridal-y to ever wear anywhere, but still significantly more practical than most things I make. Thanks for reading! And if you enjoyed this post, I have a video that goes along with it. It can be watched here! Stunning! With every post, I marvel at how talented you are. Angie, your costumes are amazing!! Do you rent them to any productions? You are so talented! Beautiful!! I don’t think it is too bridal-y to wear out. 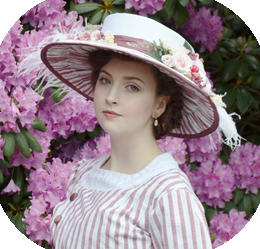 It would be a lovely spring dress for Easter or any fancy event! 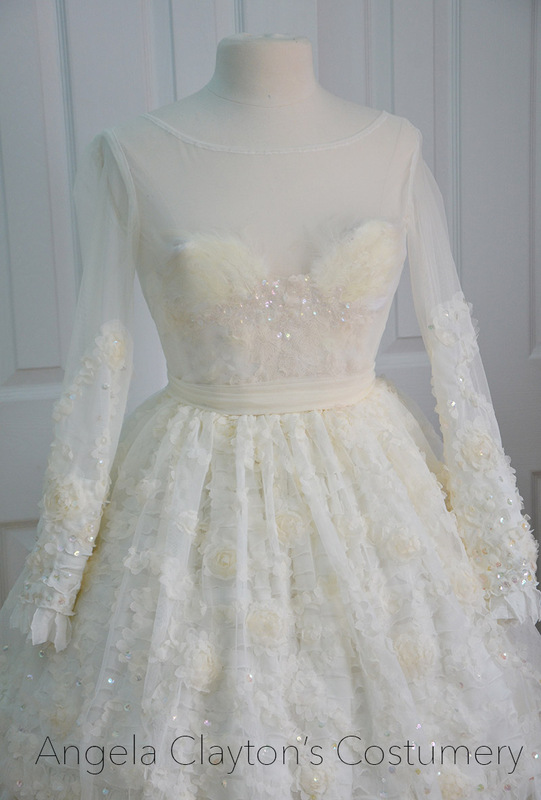 I adore the sleeves! I love that the overlay gives you two different looks from the same dress. Beautiful work as always!! I agree, I love that the overlay is a seperate piece, giving the wearer options. Very clever. I wish you had shown the back, I was curious with how you would alter the ties. Love the sleeves & your courage to change course. Your eye for design is amazing. You are really talented. 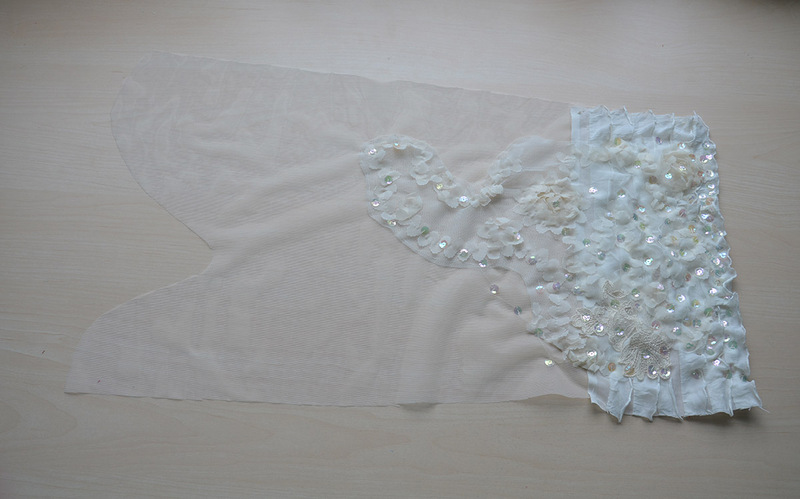 It’s inspiring to read your blog and see these wonderful dresses coming to life. Amazing art! You are blessed with an amazing talent! Everything is so feminine and beautiful. Look at Hollywood costume designers! Opps! I meant LOOK OUT Hollywood! Great dress and directions! I like the length of it too. You’ve got talent thank you for sharing. 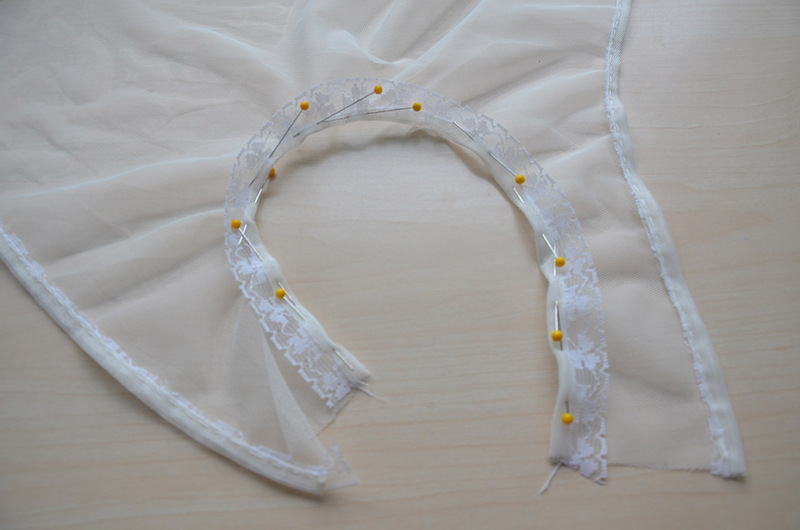 I’m making 2 little flower girl dresses with a sheer bodice overlay. I wasn’t sure how to do the neck line. That’s a great way! I’m trying it. My fabric frays and is very sheer. Have a great day! 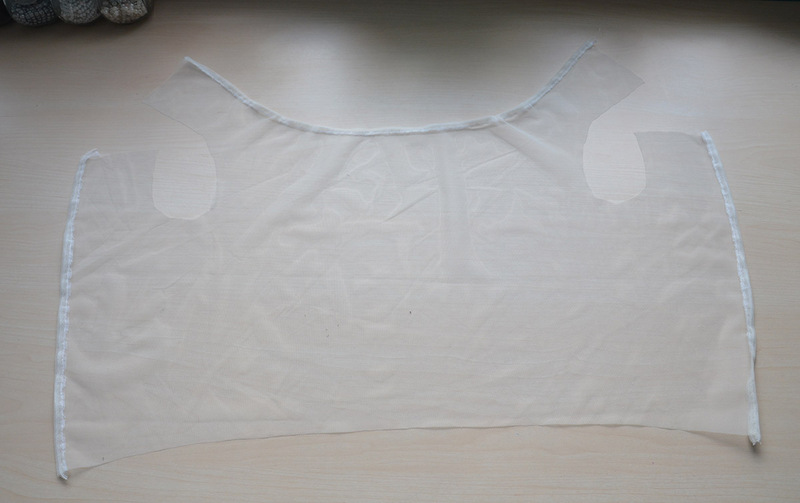 Please show a photo of the back of the bodice overlay. Beautiful dress.